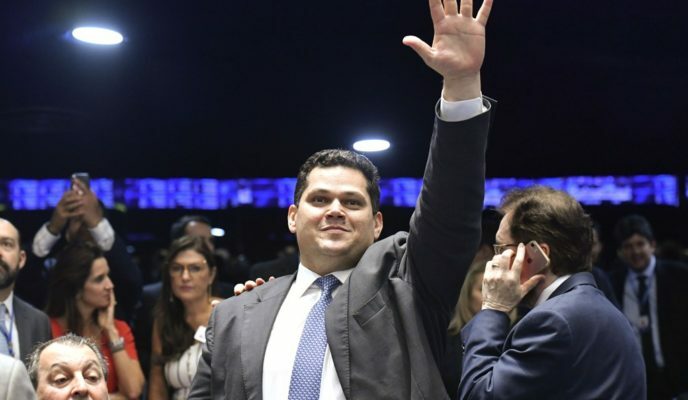 Until recently a former deputy and low-level senator, Davi Alcolumbre (DEM-AP) got into the spotlight after defeating the “all-powerful” Renan Calheiros (MDB-AL) in the race for the office of President of the Senate. Little by little, Brazilians are getting to know him. Gazeta do Povo listed four little-known and unusual facts about Alcolumbre which surfaced in the last days: he is the first Jew to head the Senate; he has already been a member of Sarney, but entered a “weird” alliance with PSoL; he’s not exactly a representative of the “new politics” (as he tried to sell himself); and is seen as “too boring” by some senators. 41-year-old Davi Samuel Alcolumbre Tobelem is a Sephardic Jew who traces his origins to Spain and Portugal. Expelled from the Iberian Peninsula in the 15th century, the Sephardim migrated to several nations. The senator’s forefathers settled in Morocco, from where they emigrated to Northern Brazil in two waves, first in 1905, and then in the 1930s. As President of the Senate, Alcolumbre may also be the first Jew to govern Brazil – at least in an interim capacity. He is the third in the line of succession to the presidency, after the vice-president (Hamilton Mourão) and the Speaker of the House (Rodrigo Maia). Member of a right-wing party, DEM, Davi Alcolumbre has already been a member of ex-president and ex-senator José Sarney’s (MDB) political group – Sarney has a strong influence in Amapá, as well as in his native Maranhão. Later, Alcolumbre became an opponent of his previous ally, and even made an alliance with PSol, a left-wing party. In 2009, when he was already a federal deputy, Alcolumbre took leave of his office to become Secretary of Public Services and Works of Macapá, Amapá’s capital, during the administration of Roberto Góis (PDT). In 2012, Góis ran for reelection with the support of Sarney’s group. Alcolumbre was also a candidate, but came in fourth place. In the second round of the presidential elections, the current President of the Senate supported PSol’s candidate, Clécio Luís, in an alliance established by senator Randolfe Rodrigues, who was then a member of that party. His justification was that it would be necessary to unite for “morality” reasons, and in order to oust Sarney’s group from power. Clécio won the race, and the alliance between Alcolumbre and the Amapá branch of PSol became consolidated – under fierce criticism from party affiliates all over the country. In 2014, Alcolumbre ran for the Senate against Gilvam Borges (PMDB, now MDB), the candidate supported by then-senator Sarney – who gave up running for reelection. Alcolumbre once again was supported by Randolfe’s PSol, and won the election. Randolfe and Clécio later joined Rede, a center-left party founded by ex-senator Marina Silva. But still, their alliance with Alcolumbre was maintained. So much so, that in the election for the Senate presidency, Randolfe was one of the main defenders of the DEM senator’s candidacy. 3) Alcolumbre is a teetotaller. Some say he is “very boring.” And he has no university degree. Davi Alcolumbre’s victory party, after being elected President of the Senate, revealed two of his personal traits: the senator doesn’t drink alcohol, and is “too boring”, according to one senator who had already drunk a couple of wine glasses. But, according to some of his Senate colleagues, the new president of the upper house is merely shy, but not boring. Alcolumbre says he is a businessman in the trade sector. And he has no university degree – he began, but never concluded, a course in Economic Sciences. Davi Alcolumbre campaigned for the Senate presidency claiming to be an alternative to the “old politics” – represented by his main adversary, Renan Calheiros (MDB-AL). But the fact is that Alcolumbre has been suspected of many irregularities, and adopted several practices which are associated with Brazilian politicians that are usually criticized. In 2017, Alcolumbre voted against the impeachment of then-senator Aécio Neves (PSDB-MG) in the Senate Ethics Council for requesting R$ 2 million from businessman Joesley Batista, owner of JBS. Then, the DEM senator voted for Aécio’s permanence in office, going against the Federal Supreme Court (STF) decision which ordered the Minas Gerais politician to step down from office. Alcolumbre trajectory in the Chamber of Deputies has also been marred by controversy. In 2005, he signed and then withdrew his signature from the Correios Parliamentary Commission of Investigation – which eventually would crack cases such as Mensalão and the vote-buying scheme for Lula in Congress. He did the same in the commission which investigated the contracts signed by São Paulo soccer club Corinthians with the company MSI. In 2015, when he was already a senator, Alcolumbre continued to live in a functional owned by the Chamber of Deputies, even after his deadline to return the keys had expired. At the time, he claimed that the Senate had no real estate available for him, and continued to live in the apartment he used when he was a deputy. Alcolumbre also didn’t escape accusations or suspicions or irregularities. In 2013, he was investigated by the Federal Police’s Operation Micah, which investigated the participation of dollar smuggler Fayed Trabouli in the embezzlement of money destined to pension funds. Alcolumbre figured in the operation for his alleged associations with the dollar smuggler. The Federal Supreme Court, however, invalidated the Federal Police’s wiretaps, and the case did not move forward. At the time, the current president of the Senate denied any irregularity. Alcolumbre’s senatorial election, in 2014, has also been questioned by the courts. The electoral vice-attorney general, Humberto Jacques, requested to the Electoral Superior Court (TSE) the impeachment of his mandate on account of alleged irregularities of his campaign. According to the Electoral Prosecutor’s Office (MPE), use used “unserviceable invoices” to justify campaign expenses. His trial in the TSE is yet to be scheduled, but the Amapá Electoral Regional Court (TRE-AP) hasn’t accepted yet the impeachment request. Alcolumbre’s 2018 electoral campaign, in which he ran for the Amapá government (and lost) is also being targeted by the electoral courts, this time after being accused of misusing the public apparatus. The MPE claims that servers of the Macapá Health Municipal Agency, administered by Clécio Luís, one of Alcolumbre’s allies, were being pressured during their working hours to take part in campaign acts of the then-gubernatorial candidate. Alcolumbre is also accused of incurring into political “familyism”. His substitute in the Senate is his brother Josiel. When he was a federal deputy, he proposed a bill (later approved) to name the Macapá airport after one of his uncles, Alberto Alcolumbre. In 2013, he used funds from his cabinet in the Chamber of Deputies to pay for fuel for his official cars in the gas station Salomão Alcolumbre, owned by another one of his uncles.